This map, of bicycle crashes in Toronto, was mentioned in the comments to the original post. And then there’s Transportation Alternatives’ invaluable crash maps. Projects like this loom on the horizon. I’d be curious to know what others are out there. The potential impact GIS (and real-time mapping) has for traffic safety (among other things) seems great, particularly as we can add sophistication to the layers: Time of day, exposure data, road characteristics, etc. Some of this requires hard coding, but I’m wondering what other information could be gleaned from mobile phones and the like. The obvious source of interest would be something like pedestrian volumes and walking speeds, as recorded by iPhones and the like; too many pedestrians moving too slowly up Fifth Avenue — extend the walk signal! But other uses can be imagined as well; “dwell time,” the amount of time pedestrians spend in public areas, could be measured, for example. Or how quickly pedestrians cross streets (this could be part of a larger Christian Nold-style “bio-mapping project” to measure particularly unpleasant intersections and the like). Vibration-sensitive PDAs could monitor potholes on streets and in bike lanes. Sensors could detect “honks” and a “honk map” could be created, with targeted police enforcement and selective traffic engineering solutions. Credit cards could be synced up with MetroCards or EZPasses to determine how much economic activity in the city each form of transportation brings. Data on red-light running from camera-equipped intersections could be fed anonymously to in-car GPS systems, as well as those on the personal devices of pedestrians. The possibilities are legion. One of the myriad problems with mapping risk is that the numbers, particularly when exposure data is absent, can lack explanatory power. Oh, there were no pedestrians struck this year on the F.D.R. Drive — this obviously does not imply a street that is safe for pedestrians. And while I do feel, like Pascal, that most of man’s unhappiness comes from not being able to simply stay quietly in his room, one must leave the house, and overhyping everyday dangers can be its own form of danger. An interesting phenomenon in terms of risk and the built environment is that what we perceive as risky is not always the place where the risk actually lies (and it’s an interesting question as to whether this misperception itself leads to the risk profile). 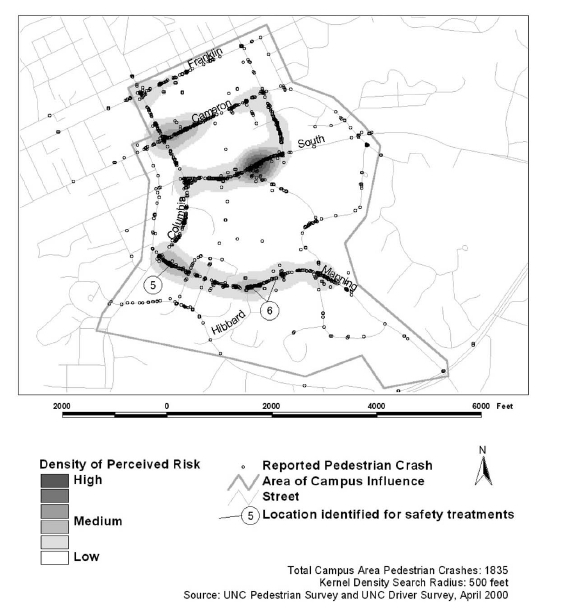 An interesting study at the University of North Carolina looked at students’ perceptions of pedestrian risk on campus versus perception and found that the two did not always correlate. The study found all sorts of curious detail, as charted in the image below (which shows a relatively equal distribution of crashes but certainly not an equal distribution of risk perception); e.g., there were more crashes near places like the stadium than people believed there were (there are certain biases to be careful of; proximity to a building in general increases the reporting of crashes, which may throw off the actual risk profile). Comments Off on More on the Geography of Danger. Click here to leave a comment. David Alpert taps into an annoyance of mine, that staple of car crash reporting known as the passive voice. Four people ranging in age from 19 to 21 were killed early yesterday in Culpeper County, Va., when their car collided with a vehicle that was going the wrong way, Virginia State Police said. As he notes, until we get to full DARPA-style automation, the sense of agency cannot be attributed entirely to the car (particularly in this case, as cars don’t choose to go down the wrong way down roads). But we seem to, and one wonders hows this plays into our cultural downgrading of personal responsibility when it comes to negligent driving. Finally, our habit of dehumanizing the actions of cars tends to create assumptions that their actions are not actually someone’s responsibility. A driver hit and killed some people in another car in Culpeper. It’s extremely unlikely his car magically malfunctioned. And even if it did, we don’t engage in the same linguistic contortions to say, for example, that a police officer’s bullet impacted a suspected robber, who had themselves been holding a gun which fired into someone else earlier in the day. That would be silly. So is this. This writer was in agreement. Comments Off on Passive Resistance. Click here to leave a comment.